We have temporarily merged two households to facilitate step-daughter Marjorie’s relocation to Floyd County. In the process, we have become a four-cat family unit and are being entertained by the political machinations that take place among the cats in our now extended family. Our cats were initially quite apprehensive about the change, as you can see. Sherman who is normally the alpha male of the household, hides behind his sister in this photo and has been quite inconspicuous since the other cats arrived. He doesn’t handle change well. We kept the cats separated for the first two days except for brief moments when they could see each other under our close supervision. This, of course, piqued their curiosity about each other and seemed to minimize the threat of takeover by the "new" cats in the area. Now we are allowing the cats to roam freely and they are beginning to interact on a more frequent basis. 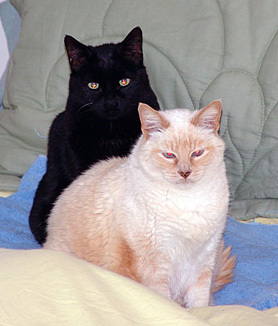 The natural leader of this feline community seems to be Marjorie’s black and white cat which is twice the size of any other cat in the group and fortunately is very placid. He is the 800 pound gorilla of this household and is cheerfully inquisitive about everything in the house including the other cats. As a result of his overwhelming size and amiable disposition, there is very little hissing and spitting as is the case when there are equally matched contenders for leadership. The group dynamics have shifted considerably since day one. The black and white cat goes anywhere he chooses and is interested in everything. Sherman, our black cat, and Marjorie’s gray kitty have become relatively invisible, coming out only to eat. They are not in contention for leadership in any capacity. Buffy, our cream-colored cat, is definitely scheming to take control. She is one of the smallest cats in the group. but she has a strong personality and a strong resolve to control her environment. She makes no overtures to the larger cat, but makes it come to her and then she ignores it pointedly. As a result, the black and white cat finds her indifference interesting and she is beginning to exert control over it. She is using her personality to dominate rather than strength and she will probably succeed. She was quite successful with this approach with Doug Thompson’s cats when we stayed there during the 2005 holiday season. Cat behavior is this kind of situation is so similar to employee behavior during a corporate merger that it is worth observing. Which role did you play in the last corporate merger you were involved in? 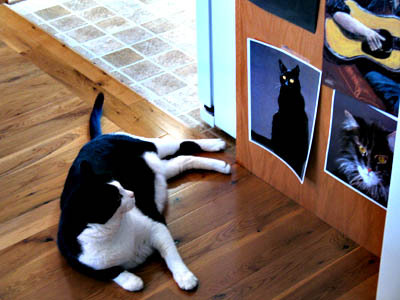 This entry was posted in Cat Blogging and tagged cat blogging, cat organization, feline politics, merging households. Bookmark the permalink. What role did I play? I’m a mouse, I kept well out of the way while the cats did play, and fight and bite, and tear each other’s fur out…. You might could turn these observations into a book, or even TV show: The Cat Whisperer. Happy Thanksgiving.